I guess that cars are getting boring these days and if you need something from a supermarket why not take a chopper? 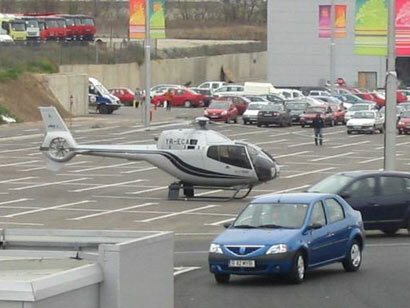 Two Romanian men landed a light helicopter between cars in a supermarket car park. According to Romanian civil aviation laws, helicopters are not allowed to land in populated areas without precaution measures. “It’s the third time I’ve seen people coming shopping in their helicopters. I heard they are important persons but I think they’re a little snobbish too,” said Adrian Enescu – a worker in a supermarket.